Captive Revolution: Palestinian Women’s Anti-Colonial Struggle within the Israeli Prison System, by Nahla Abdo. London: Pluto Press, 2014. 264 pages. Afterword to p. 212. Notes to p. 224. Bibliography to p. 240. Index to p. 250. $99.00 cloth, $34.00 paper. Students and general readers need look no further for a feminist account of the struggle of Palestinian women political detainees in Israeli prisons. 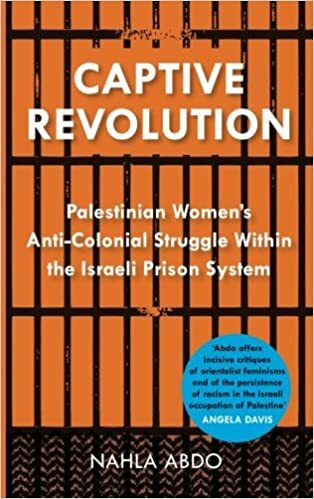 In Captive Revolution, Nahla Abdo reviews the history of this struggle by examining the personal narratives of seventeen Palestinian women political detainees whose stories of incarceration bring attention to “the plight of over 5,000 Palestinian political prisoners who currently suffer torture and inhumane treatment in Israeli prisons” (p. 1). Despite repetition and redundant references to the layout of the argument throughout the book, Abdo charts a Palestinian history of anti-colonial gendered resistance. This history is narrated from a position of both intimate and critical distance. The women identify Abdo as an outsider who does not belong to a political faction, and yet an insider who, like themselves, was once a political detainee, making them “much less reluctant to divulge their experiences with confidence” (p. 8). In the introduction, Abdo reflects on how this complex position informed her research methodology, asserting the merits of approaching the personal stories of incarcerated Palestinian women with a clear political sensitivity and solidarity. In chapters 1 and 2, the author focuses on the history of Palestinian women in Israeli prisons within the contexts of other anti-imperialist and anti-colonial struggles. First, she reviews the common mechanism of silencing and the criminalization of women political detainees in the Third World and the black civil rights movements in the United States in the 1960s. Abdo observes that while women were detained for taking part in an armed struggle for freedom and liberation, they all suffered psychological, verbal, and sexual abuse in imperial and colonial prisons that delegitimized their struggle and rendered them as violent Others. In the case of Palestinian women, the author illustrates the strong link between global forces of imperialism and colonialism. She details how Israeli writers and scholars have used language of Western feminism and racist Orientalist ideology to refer to Palestinian women fighters as “terrorists using ‘suicide bombing’ for personal, psychological, religious and cultural reasons” (p. 59). Abdo rightfully refutes these accusations in her juxtaposition of interviews with women who comprised the first generation of female Palestinian resistance fighters in the late 1960s, such as Aisha Odeh and Rasmea Odeh, and women who participated in the second intifada. Indeed, almost all the Palestinian women interviewed used the term “munadela” (freedom fighter or revolutionary resister) to define themselves (p. 11). They also described their struggle as part of the fedayeen movement (freedom fighter movement), which was banned by the West (especially by the United States and Israel) and “dubbed as a terrorist movement” (p. 12). Moreover, all of them emphasized that “fighting for their political and national identity and freedom [was] an ‘honourable’ task” (p. 66). The emergence of Palestinian resistance culture in the 1960s through the 1980s as a rich base for Palestinian collective memory and identity, and as an inspiration that motivated female (and male) fighters in their anti-colonial struggle, is the major theme of chapter 3. Here, the author provides an overview of Palestinian art and literary works, poetry in particular, that form the canon of adab almuqawama (resistance literature) and its subset adab al-sujun (prison literature). Although this chapter highlights the historical invisibility of Palestinian women in this canon, the author neither fully addresses how the corpus of Palestinian women’s literature formed a separate canon of resistance literature, nor the fact that Palestinian women detainees wrote stories and poems in prisons and contributed to the canon of adab al-sujun. In chapters 4 and 5, the author concentrates on firsthand accounts of arrest, interrogation, detention, and torture, in addition to testimonies about life in prison and after release. These narratives reflect the overall strength of the book as they reveal the various strategies of individual and collective feminist resistance that the women developed in prison, including “raising feminist consciousness through reading and discussion sessions,” (p. 202) as well as exercising verbal and psychical means of resistance against “Israeli prison authorities’ tactics of using women’s bodies and sexuality as a tool to force them to submit” (p. 173). These narratives demonstrate that Palestinian women detainees were not only aware of how the Israeli system gendered their bodies as colonized women, but also how they were able to assert agency over their bodies by refusing orders, organizing hunger strikes, and conducing work stoppages. Here, Abdo successfully integrates the women’s narratives into the larger critical framework of anti-colonial resistance. She equally succeeds at examining Palestinian feminist resistance through a close analysis of the narratives of ex-detainees about life after prison in Palestinian society. In dissecting their use of feminist language to address social hardships, discrimination in the labor force, and continual gender discrimination, Abdo concludes that the struggle for national liberation essentially entails the liberation of Palestinian women in their own society. Amal Eqeiq is visiting assistant professor of Arabic studies and comparative literature at Williams College.